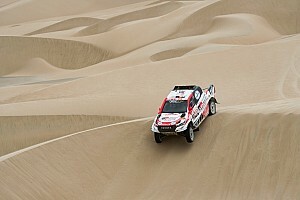 Dakar 2012 has a new twist for the competitors in all four classes: Bike, Car, Quad and Truck. Instead of the past routes taking them through Argentina to Chile and back, Peru has been added to make the event a coast-to-coast adventure in South America. In addition to the new route, one of the top teams in recent years has withdrawn. It is not surprising that changes occur to what is one of the most demanding endurance events: The Dakar! The first Dakar was the brainstorm of Thierry Sabine who discovered that the changing landscape in Africa offered a unique challenge. He was lost during a rally event in Africa and upon his return to France, Sabine proceeded to design a rally raid that would start in Europe on a route to Algiers before crossing the Agadez and would take the challengers to Dakar. Sabine commented on his idea that it would be "a challenge for those who go. A dream for those who stay behind.” Since the first event in 1978, the Paris to Dakar rally has seen changes and the start moved over the years. No matter its start, the ending was at Dakar until the organizers deemed it unsafe due to terrorists’ attacks in the African Continent and they cancelled the Dakar in 2008. "I think the rally will only be decided on the final stages in Peru. 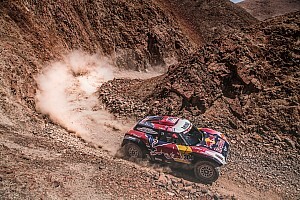 In 2009, the new route in South America became the “Dakar”. 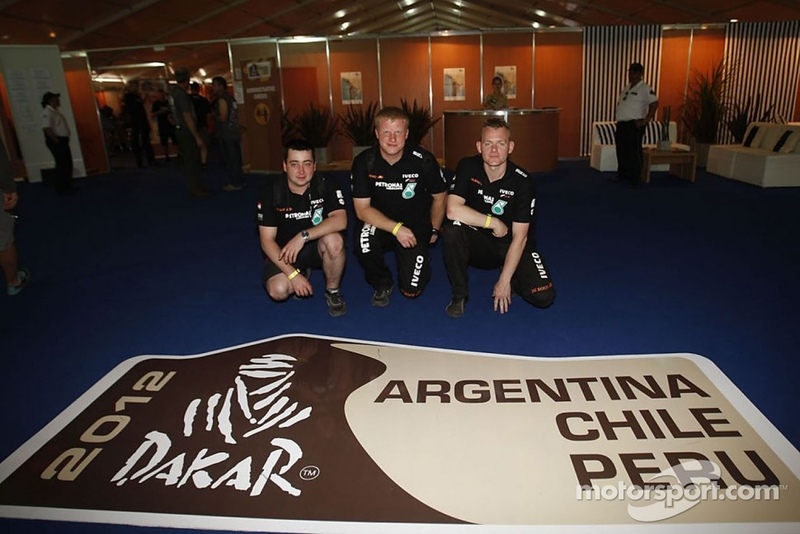 Argentina and Chile were the host countries but for the 2012 edition, Peru has been added to the 2012 route that over a 30 year span has seen 27 countries become a host nation for the legendary rally raid event. The historic event this New Year will cover territory in three countries with roads from soft sand to rocky trails. The route will take the competitors across the Andes mountains, the deserts, the rivers and, of course, a variety of sand dunes. On January 1st, the start will be in Mar del Plata, Argentina on the Atlantic Ocean side of South America and will end in Lima, Peru alongside the Pacific Ocean on January 15th. There are 465 entries for the 2012 challenge; an increase of 15% from 2011. The newest edition will cover over 9,000 kilometers over 14 stages plus the one rest day, again in Chile. Both Chile and Argentina will host 5 stages apiece while Peru will host the final four plus the finish which can, even if rarely, change the final order. While the entries are up, there are changes. Volkswagen is resting on its laurels after sweeping the podium in 2011 and is therefore not mounting a challenge this year; especially since they are the only marque to take the Car class win since the move to South America. Volkswagen is preparing for their entry into the World Rally Championship and 2010 Dakar legend Carlos Sainz is a key member for their future goal. However the BMW X-raid team will field a total of eight cars with five MINI All4 Racing and three BMW X3CCs. 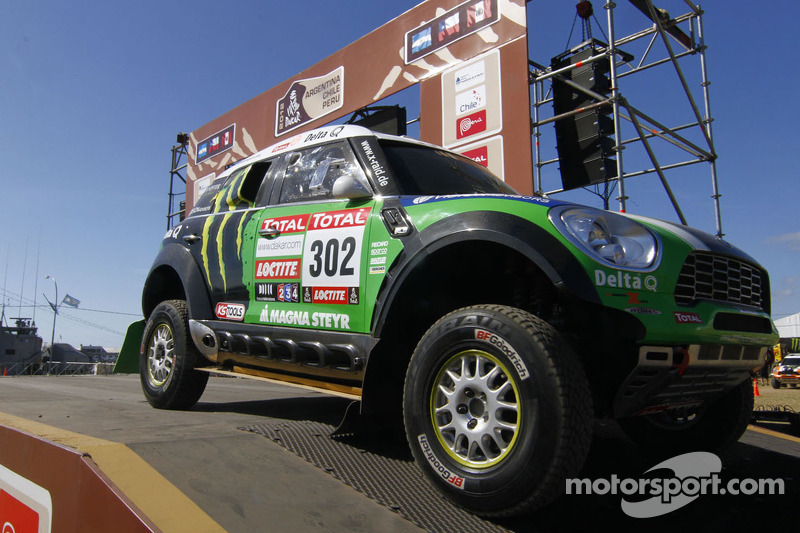 Racing one of the MINIs, Stéphane Peterhansel will be aiming for his 10th Dakar victory and his fourth in Car; previously he has taken the Bike category legend status six times. Another former Bike winner at Dakar, Joan Nani Roma will again attempt to score a Car win with the X-raid team. A third MINI will be in the hands of Holowczyc Krzysztof. “We'll have to deal with much more sand than in the past rallies," said Peterhansel. "I think the rally will only be decided on the final stages in Peru. I had the feeling the organizers found it hard last year to find new and difficult routes. Now we are entering new territory again." Last year’s Car winner landed a ride with one of his former rivals. 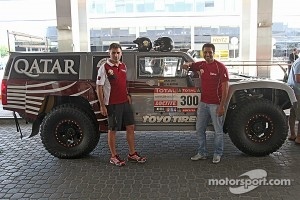 Nasser Al-Attiyah will be in a Robby Gordon prepared Hummer H3 under Team Qatar. “The idea of not doing the Dakar was terrible. After Volkswagen's withdrawal I was bothered because I really wanted to defend my title. I looked for new solutions and I knew I needed a different challenge. I didn't want to drive a car similar to the one I won with. The best solution for me would be to drive the two-wheel drive Team Gordon Hummer. I also looked at this year's route and I said to myself that this car do well,” he said. The American who made his name first in off-road racing before moving to NASCAR will be one of Al-Attiyah’s rivals! Robby Gordon proved last year that the Hummer can handle nearly anything tossed its way but the Dakar legend status still alludes him. South African’s Giniel De Villiers to the changes as the 2009 winner in the South American Dakar event will be behind the wheel of a Toyota Pickup HILUX for the Overdrive team. Marc Coma returns to defend his 2011 Bike legend status. The three time Dakar winner will aim to place his KTM again on the top step of the final podium. Coma will have his work cut out for him as Cyril Despres (KTM) finished second last year but wants to break the current tie and end up with the fourth Bike win! It will be a good battle again in the Bike category but even though KTM riders can be listed as the favorites, Helder Rodrigues who finished third last year aims to hand Yamaha the victory for the first time since 1997 when Peterhansel landed the Bike win. Coma commented after a day of scrutineering: “Everything is fine. We are looking forward to start after these days in Mar del Plata, with all the accumulated tension. Truth is they are difficult moments, that we dedicated to distribute the luggage and the material we will need during the Rally. Now we can have our minds only set in the race". The heavy Trucks from Russia will return to defend their sweep of the podium! Kamaz has lost its two key drivers. Lead driver Vladimir Chagin landed his seventh Dakar legend status last year which is a record in the Truck category and his teammate Firdaus Kabirov placed second again but did win in 2005 and 2009; however both are retired from competition. That means that either Ayrat Mardeev, who finished third in 2011, or Eduard Nikolaev, could take the lead and a possible first Dakar win. The Russian team is so strong that since 2000, only two other teams have ever beat them. Gerard de Rooy and 2007 Truck winner Hans Stacey are now teammates and Team de Rooy also added two-time WRC champion Miki Biasion as a driver. Biasion realizes that even with the two top Kamaz drivers gone the Russian team will still not be easy to beat. “To beat the Kamaz team, you need a team made up of several very competitive trucks,” said Biasion. “This year, De Rooy has managed to do just that, so there is a genuine opportunity of victory”. 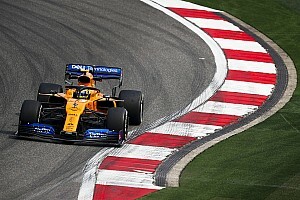 Adding a twist to the Truck class is a former Formula One driver and who currently has taken time to contest endurance racing but with a sportscar and not a heavy truck. It will be interesting to watch the Xdakar DAF to see how well Jos Verstappen will perform. In the Quad category, it could be again a rival between the two brothers from Argentina. The quads, like the Trucks, have slightly different routes during the special stages due to the difficulties on the stage. Last year, Alejandro Patronelli took the win and the year before his brother Marcos Patronelli held the Quad honors. They both will have stiff competition from Josef Machacek from Czech and Poland’s best rider Lukasz Laskawiec. 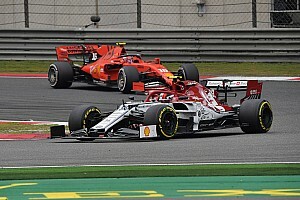 Stay tune as Motorsport.com reporters will again provide our readers with daily stage reports or breaking news.